Robox is a WiiWare action platform game developed by Dreambox Games. Dreambox Games are a new Spanish development company and Robox is its debut game. The game offers retro style shooting with the best visuals the WiiWare has to offer. 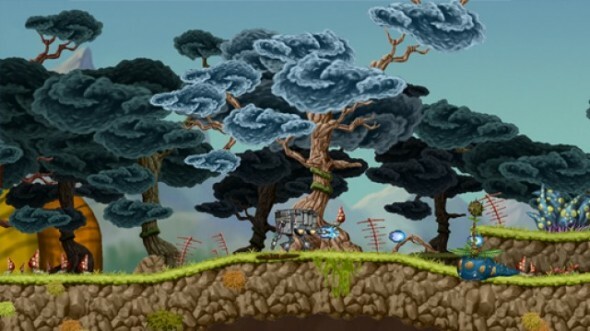 The game has a variety of different environments to explore and will take an average gamer a long time to complete this game. The game plays very much like the Metroid series. You play as a droid character that has crash landed onto a dangerous planet and has lost all of its powers. You slowly work through the game finding ‘power ups’ to gain access to areas that couldn’t be accessed before. Being a Metroid fan, I was immediately able to get into this game as the formula was very similar. However, what sets this game apart from Metroid is the ability to go inside of the droid itself. When playing through the game you come across some small creatures that you have to collect. You then control these creatures inside the droid by pressing the minus button, and then solve a whole new set of puzzles inside the droid. This then gives the droid on the outside different abilities. These friendly creatures have their own individual abilities and move very differently to one another. Another aspect that sets the game apart from Metroid is the vast number of ‘checks points’ and ‘save points’ that also act as teleports to previous locations you have already visited. The controls are simple – the character can be controlled left and right with a jump and shoot button. One of the most noticeable problems with the game was the lack of shooting in other directions. The droid can only shoot left or right which makes the game extremely frustrating when enemies come from underneath or above you. One of the first enemies you encounter just happens to be a flying insect which flies around, coming at you in every direction. The controls also change when you encounter certain situations. A good example of this is when you are being carried by a creature to get to a different location. As the droid is travelling you point at the screen and shoot like a light gun game as swarms of insects fly at you. The controls change again when you go inside of the droid and you use the pointer with the thumb on the d-pad to control the creature. Robox would have been much more enjoyable to be able to play the whole game like this as the lack of shooting in more than two directions becomes annoying. The graphics in Robox are the best looking graphics on the WiiWare. The developers have gone for a 2D style, offering great character designs and rich colours which are on par to the quality I have seen in games like Muramasa Demon Blade. The game did have me stopping and staring at graphics, only to start noticing that when you leave the droid doing nothing, he will randomly do some amusing dance moves. Overall, Robox looks a lot prettier than it plays. Dreambox Games obviously has amazing artists in the company, but some of the game play just seems to have hiccups in places. The game has some unique moments and being a Metroid fan, I was quickly able to get into the game as it was very rewarding to solve puzzles and get into areas that could not be reached. I would recommend this game to any old school gamers and Metroid fans. However, if you are easily frustrated in games then I would advise avoiding this game.